1/2 Kg (Gross Weight) Soan Papdi from Haldiram.A mouth watering treat of soan Papdis which are sure to bring that sweet smile on the face of the recipients. with Roli Tilak and Chawal. 1/2 Kg. (Gross Weight) Soan Papdi from Haldiram with Bhujia. A mouth watering treat of soan Papdis which are sure to bring that sweet smile on the face of the recipients. with Roli Tilak and Chawal. 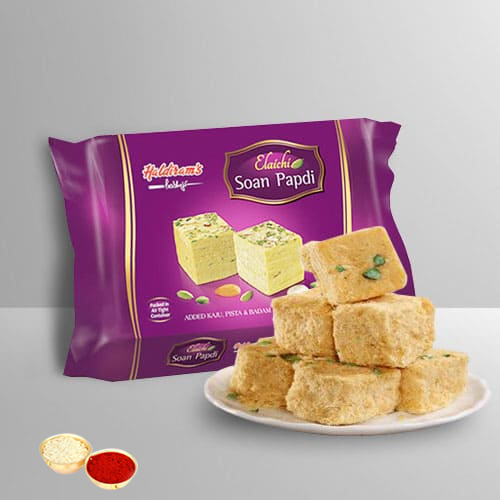 1 Kg (Gross Weight) Soan Papdi from Haldiram .A mouth watering treat of soan Papdis which are sure to bring that sweet smile on the face of the recipients. with Roli Tilak and Chawal. 1 Kg. (Gross Weight) Soan Papdi from Haldiram with Bhujia.A mouth watering treat of soan Papdis which are sure to bring that sweet smile on the face of the recipients. with Roli Tilak and Chawal.